This long necklace from Roberto Coin's Princess Flower collection has a fabulous floral-motif. 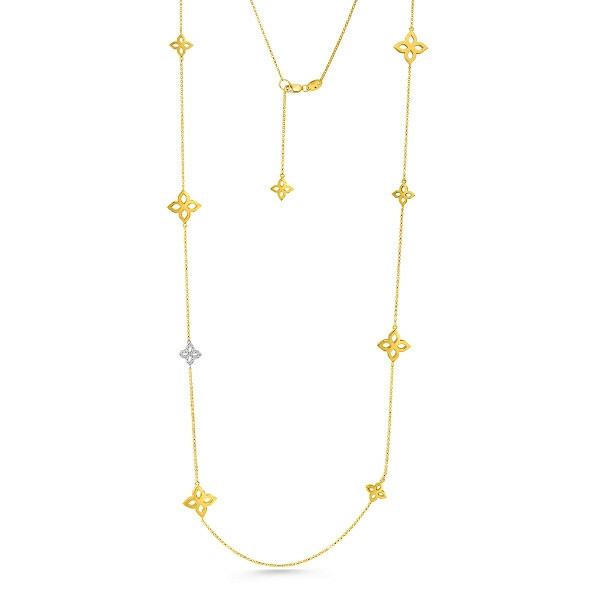 Crafted in 18K gold, a series of assorted-size openwork petals, in clusters of four, are positioned around a 34" yellow gold chain. One of these stations, embellished with diamonds, is set in white gold, the better to showcase the sparkle of the gemstones.This Roberto Coin station necklace, with echoes of the past, is well-suited to today's lifestyles, transitioning from day to night with ease.